If you're after a casual yet absolutely chic look, opt for an Elizabeth and James fleur tie neck blouse and a blue denim mini skirt. Both pieces are totally comfy and will look fabulous together. When it comes to shoes, this ensemble pairs nicely with tan leather wedge sandals. This pairing of a white ruffle long sleeve blouse and black skinny jeans is the ideal balance between comfy and flirty. 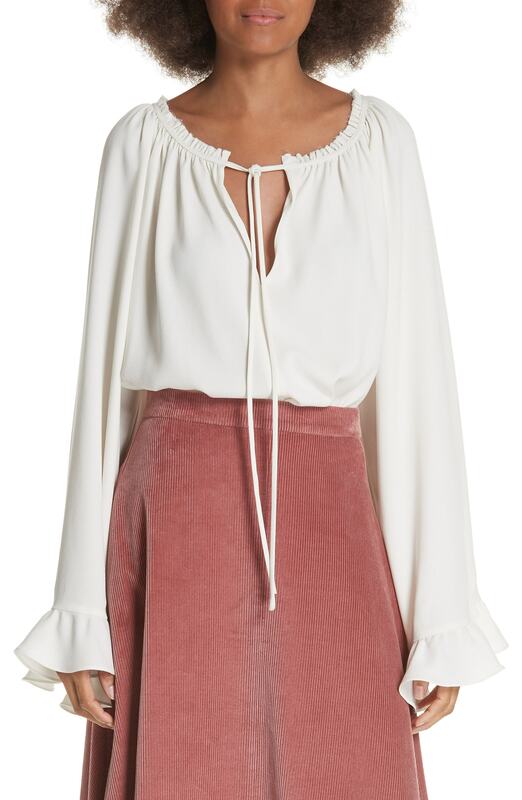 If you're on the lookout for a casual yet stylish look, pair an Elizabeth and James fleur tie neck blouse from Nordstrom with black tapered pants. Both pieces are totally comfy and will look fabulous together. When it comes to footwear, this look is finished off really well with black leather ankle boots. If you're hunting for a casual yet chic look, team a white ruffle long sleeve blouse with a multi colored vertical striped maxi skirt. Both garments are totally comfy and will look fabulous together. Rock a pair of black leather pumps to va-va-voom your outfit. If you're on the lookout for a casual yet totally stylish ensemble, team an Elizabeth and James fleur tie neck blouse from Nordstrom with blue jeans. Both items are totally comfy and will look fabulous paired together. Up the ante of your getup with olive leather tassel loafers. If you're on a mission for a casual yet absolutely chic ensemble, reach for an Elizabeth and James fleur tie neck blouse and black ripped skinny jeans. Both garments are totally comfy and will look fabulous paired together. Wearing a pair of navy suede ankle boots is a simple way to add some flair to your getup. If you're looking for a casual yet chic ensemble, marry an Elizabeth and James fleur tie neck blouse from Nordstrom with grey skinny pants. Both items are totally comfy and will look fabulous paired together. When it comes to footwear, this outfit pairs nicely with grey suede pumps. If you're searching for a casual yet absolutely chic ensemble, choose an Elizabeth and James fleur tie neck blouse and black skinny pants. Both pieces are totally comfy and will look fabulous together. When it comes to shoes, this getup is finished off nicely with black leather pumps. 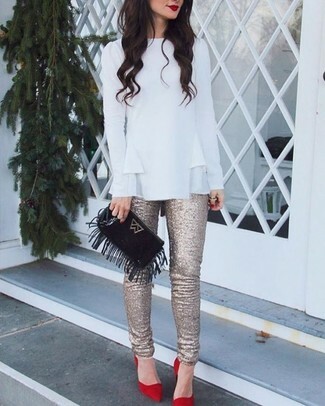 If you're after a casual yet stylish getup, pair a white ruffle long sleeve blouse with gold sequin skinny pants. Both garments are totally comfy and will look fabulous together. When it comes to footwear, this getup is round off wonderfully with red suede pumps.